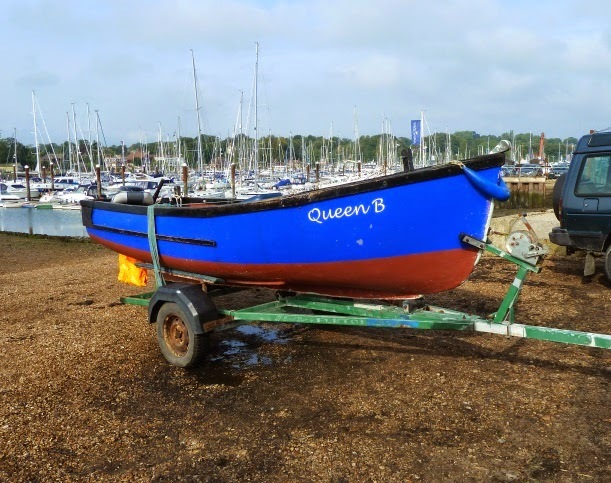 A couple of guys were launching Queen B down on Swanwick Hard at the back end of last year, she's currently set up as a fishing boat with an outboard and a very salty wooden ship's wheel. 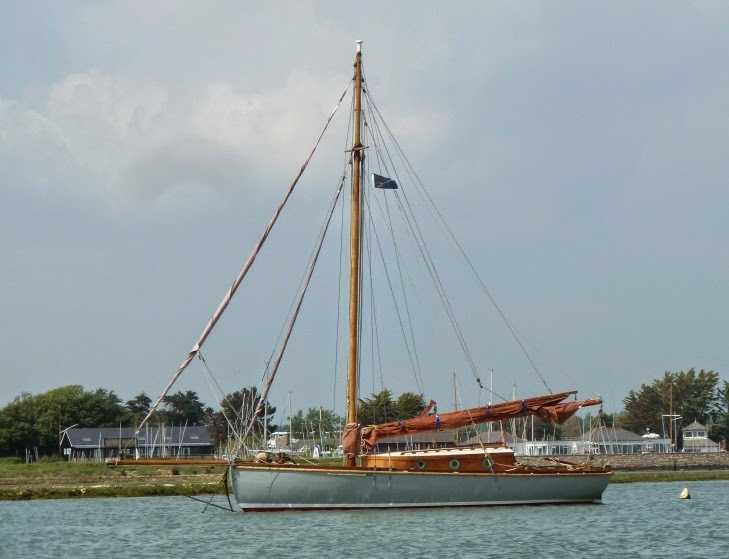 Other than the description that she is a Langstone Lugger the current owner didn't know much about the history. Queen B is solidly constructed in GRP so presumably she was built by a small yard and based on a traditional boat. Google didn't turn up any references but Inshore Craft: Traditional Working Vessels of the British Isles by Basil Greenhill mentions "luggers from Langstone and Chichester harbours " being typically 15 feet long with 5 feet 6 inch beam, employed for oyster dredging and beam trawling with a dipping lug sail and which was often found to be easier to row for short distances to windward. 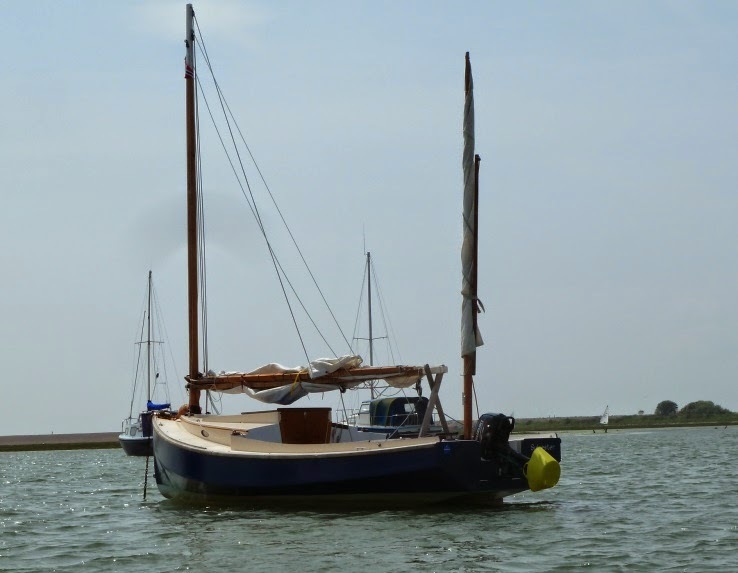 If anyone has more information on the Langstone Lugger please drop me and email. 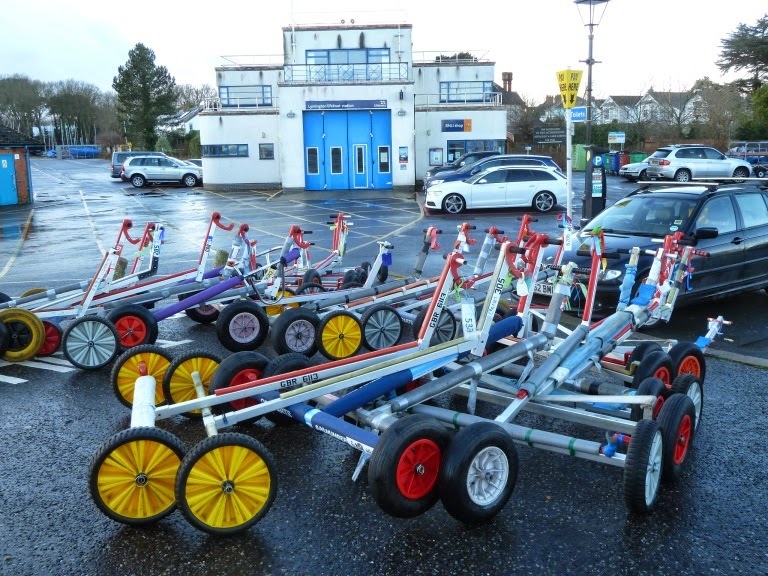 A local mystery, on a recent Saturday morning the trolley park was full, trailers for Optimist dinghies or similar by the look of things. But there was no sign of anyone sailing anywhere. 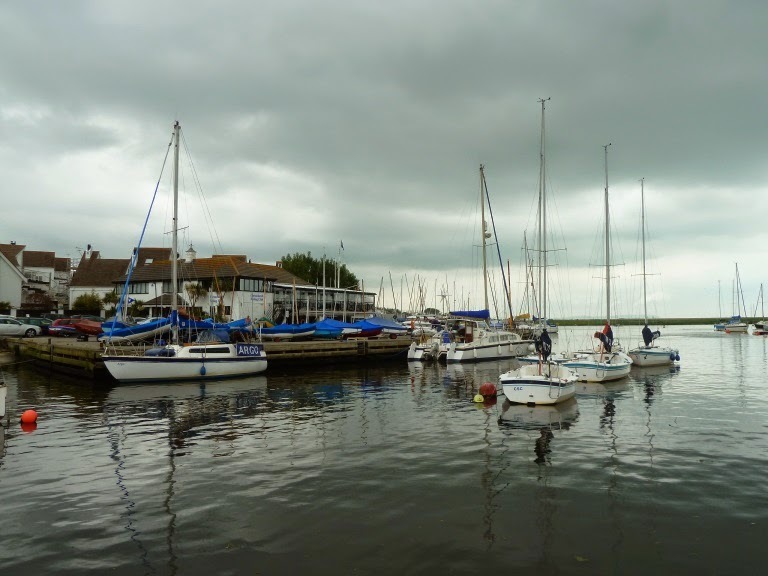 Maybe the Royal Lymington just ran out of space on the dinghy pontoon, or brought all the trolleys ashore as protection against the gales during the week. The new owner of our First 21 Matilda Emilie (now renamed Valkyre) sent me some pictures of her first race from her new base in Scarborough. 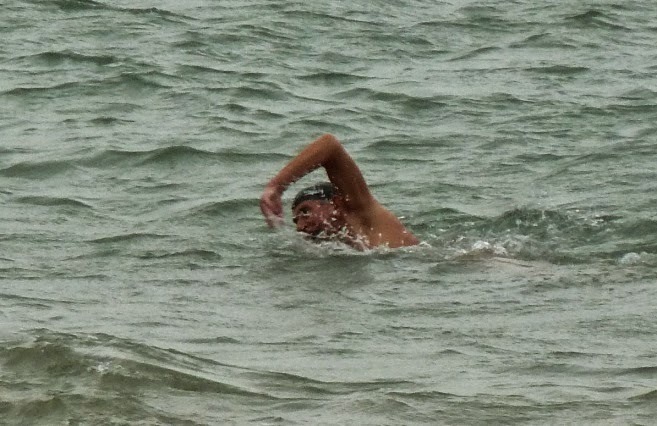 In Roger's own words "It was b****y cold", not exactly a surprise racing out in the North Sea during January, all credit to him and his and crew. 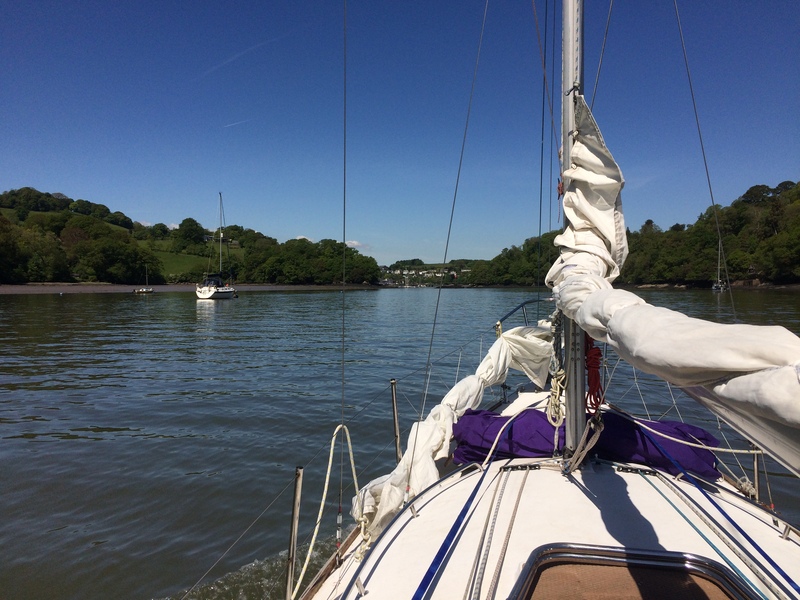 Apart from the temperature the conditions look good for some nice sailing and she looks to be sailing well. 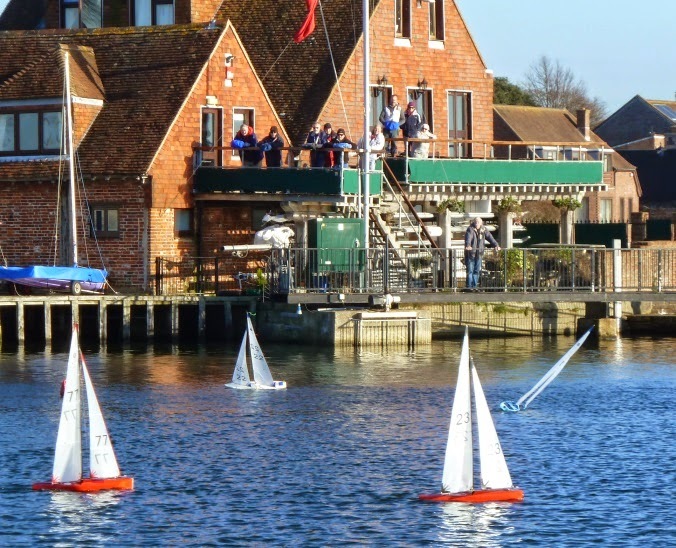 Locally the Royal Southampton YC run a Frostbite Series of races starting in January, with Scarborough being located about 300 miles to the north I wonder if they call it "the Brass Monkey Series"? 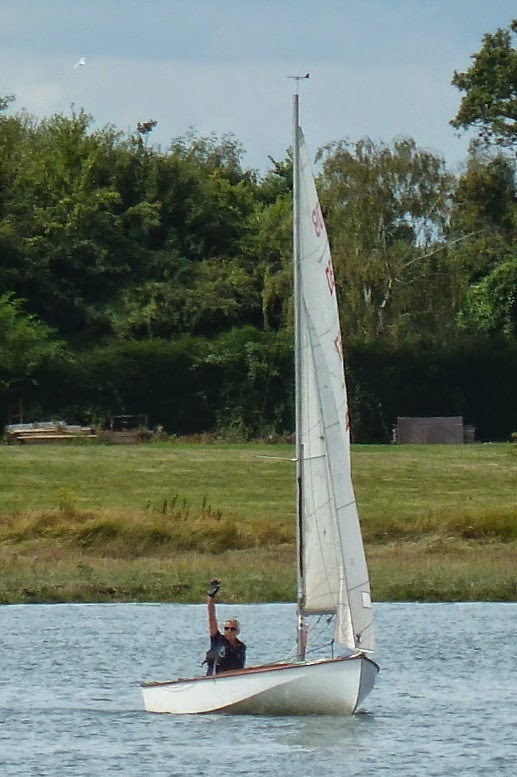 Having a picnic lunch back in summer and watching the racing at Dell Quay we spotted this dinghy, the rig with the DB insignia clearly coming from a Yachting World Day Boat, which coincidentally is one of my favorite dinghies. Instead of the DB's lovely clinker hull there is very hard chine which sweeps up to meet the sheer well astern of the stem. It's an unusual configuration and one I've seen before but just can't remember where and on what boat. I couldn't get very close so the pictures of Fort Victoria don't really do her justice. She's a heavy duty single engine launch, length somewhere around 30 feet or so, strongly constructed and by the look of her an ex military vessel. Who knows perhaps she has a connection to the RFA Fort Victoria aboard which daughter Katy served out in the Gulf and Indian Ocean. 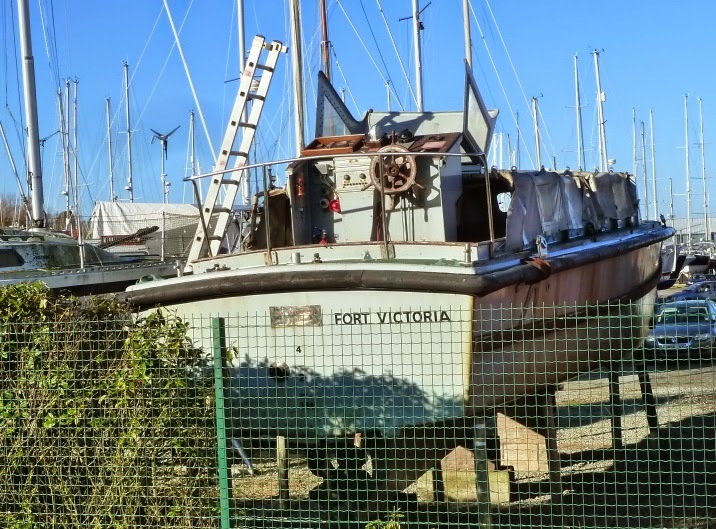 I hadn't noticed the name nor made the connection when I saw her, I was thinking that she would make an interesting conversion as a motor boat for the Solent. 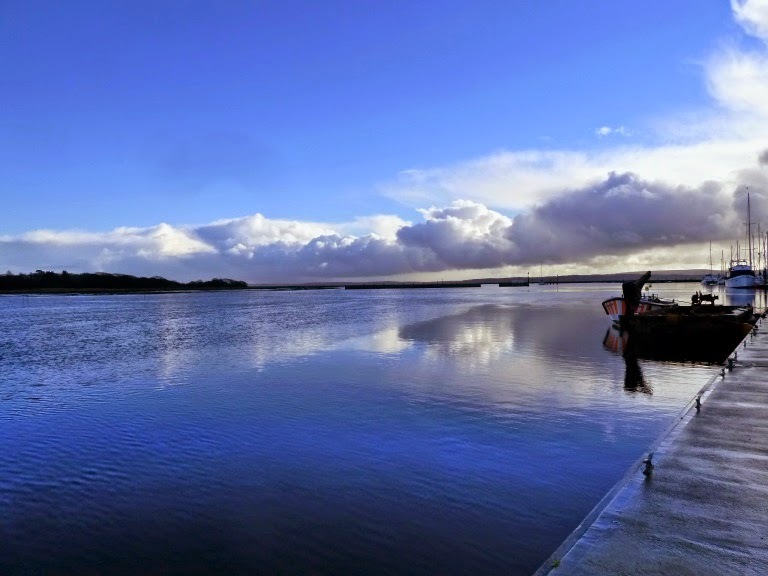 In contrast to the howling gales that passed through during the week Saturday morning brought a flat calm winter's day. 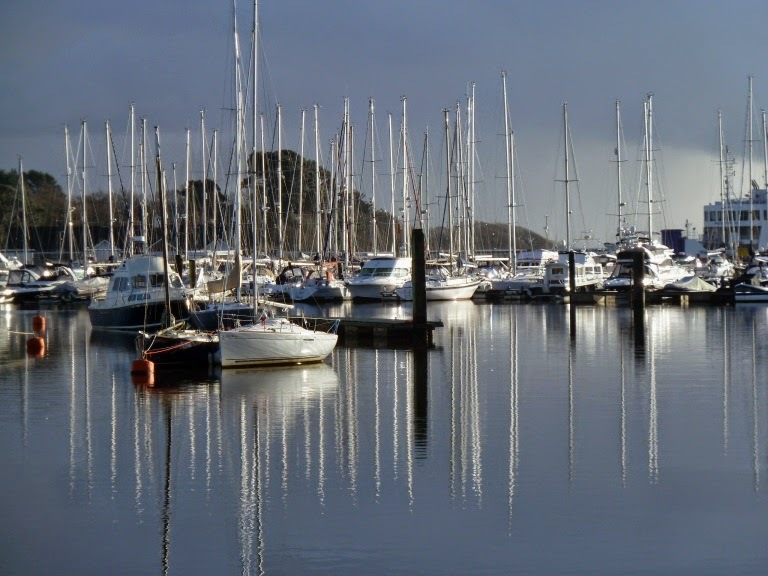 Near the town quay in Lymington the water was like a mirror, a good day to go out and check on the boat on it's mooring, even run the engine and charge the batteries if you have left the boat afloat. Further down river all the boats are gone, presumably ashore and the moorings have been completely removed giving an unusual and uninterrupted view across the saltings. Better make the most of it, no doubt the boats will soon be back. 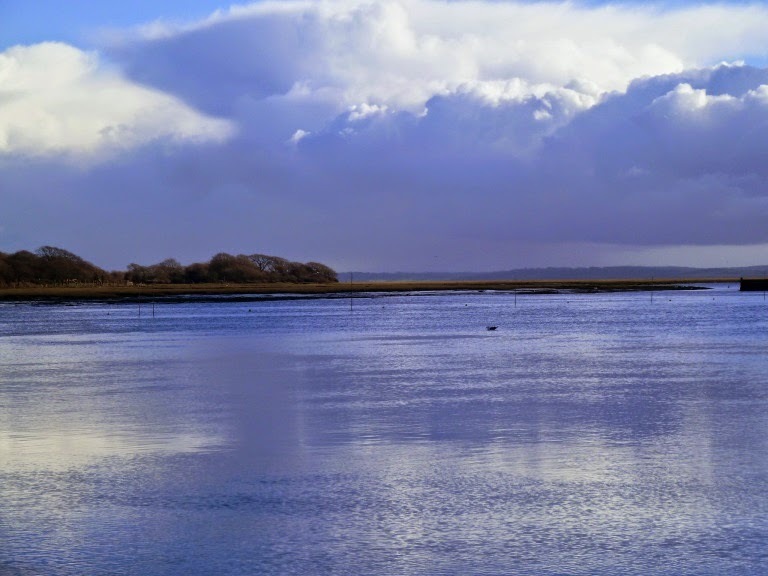 While the water was still and tranquil the same could not be said of the sky, with fast moving moody clouds and the odd shower coming in fast, fortunately disappearing quite quickly too, giving just enough time to duck into a coffee shop to watch the rain in comfort. It was a great day to be out. In the depth of winter it's nice to recall sunny days of summer. 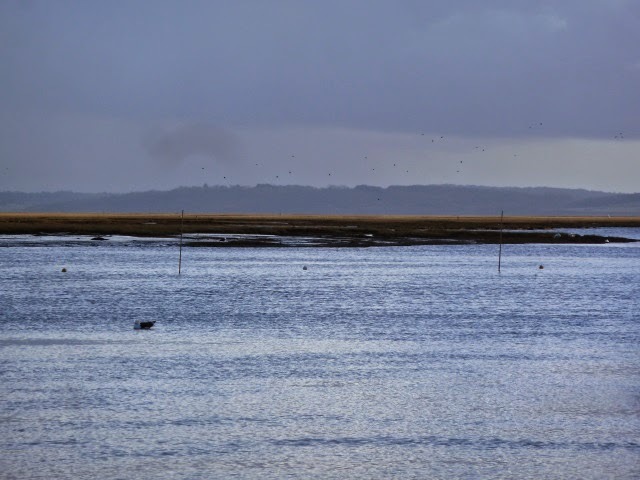 With a midday high water and a fine settled day we took the opportunity to explore Keyhaven and the channel going down to Hurst Castle in the kayaks. 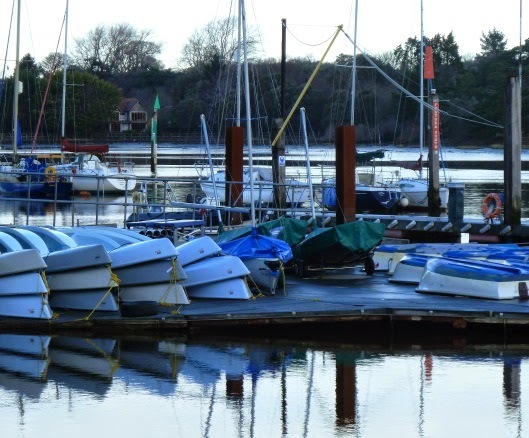 The route winds through the moorings and revealed some interesting boats which aren't visible from the shore. First up above a lovely gaff sloop, I think grey topsides and varnished coach roof is such a great combination. Not a classic below , but Dudley Dix designed Cape Cutter is a really good looking and high performance little gaffer. 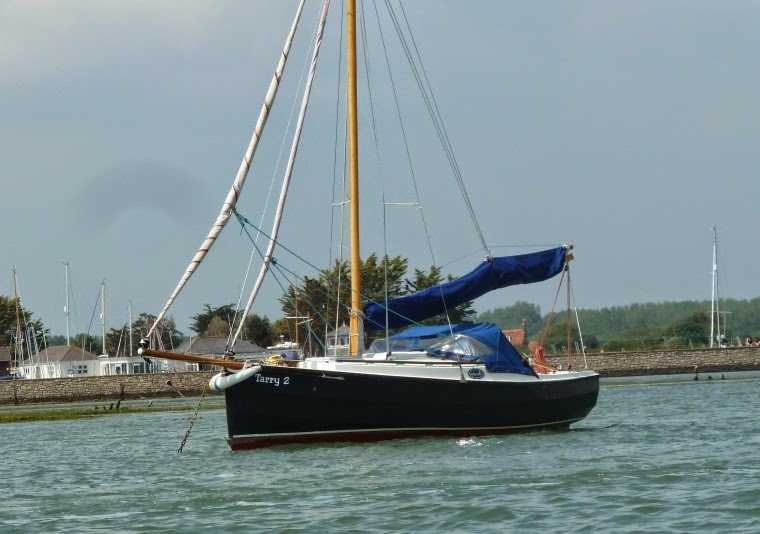 I remember reading in Wooden Boat Magazine where the design was compared to a Mini Transat, well maybe not, but from a friend who had one I hear they are fast and fun to sail. Rare on this side of the Atlantic Phil Bolder designed Chebacco probably in spirit a design close to our Drascombe Coaster. Ideal for exploring the creeks and shallows. 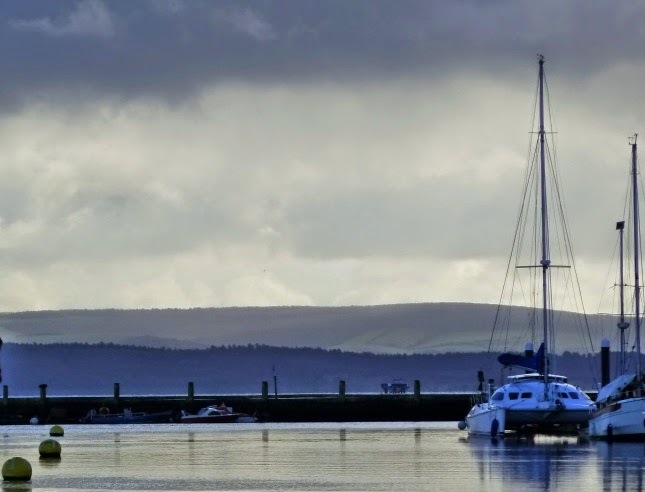 Sailing from the comfort of the yacht club balcony seems very sensible during the recent cold spell. 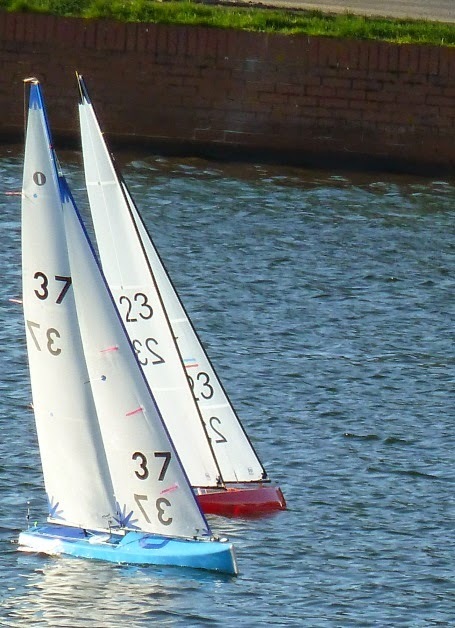 There was some close racing and I guess the skippers were pretty close to the bar once they had crossed the line. Nice way to race. 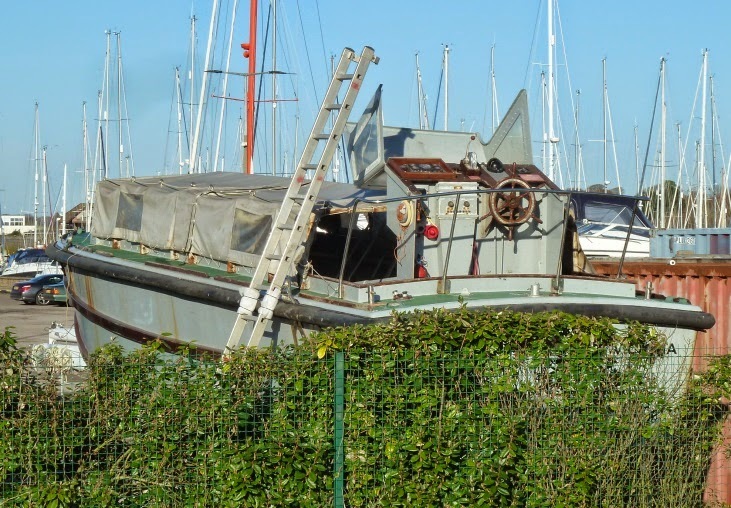 With Matilda Emilie sold, I left the regular survey of the mooring gear until I had some time over the Christmas break. 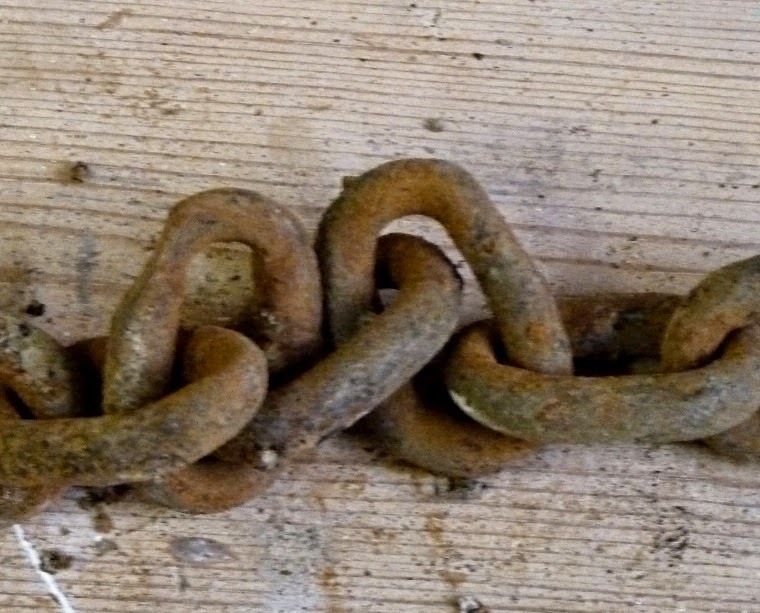 While the shackles were in quite good condition and came apart relatively easily, despite being submerged for most of the time, the wear and wasting was a concern as shown below. 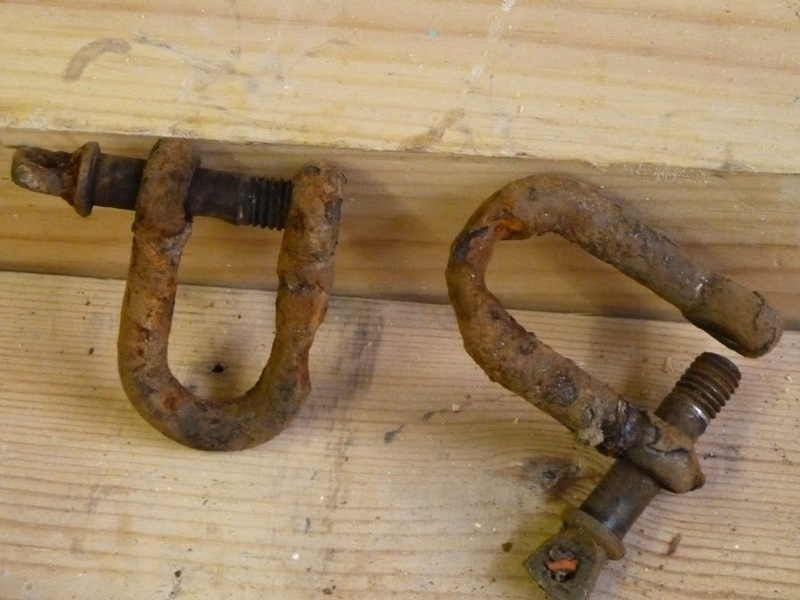 These have only been in use to two seasons as I bought all new gear when Matilda was moved to her mooring at the beginning of 2013. She's not a heavy boat at 21 feet so I presume the wear must be down to the constant abrasion or maybe inferior materials. The Bramble Bank, our local sand bar catches a few boats every year, racers cutting the corner too closely or cruising boats not paying attention, but it just goes to show it can happen to anyone. 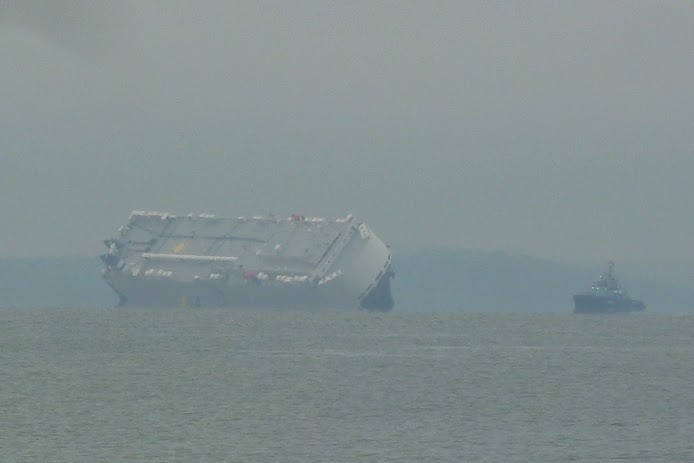 The 150,000 Ton car transporter Hoegh Osaka went aground late on Saturday evening, the cause isn't known and the conditions were very good, but reports suggest that the captain deliberately ran the ship aground to prevent a capsize. Sunday morning and the local vantage points were packed. Unfortunately the distance and haze were a bit too much for my compact Panasonic, but there are some good pictures on the link above. 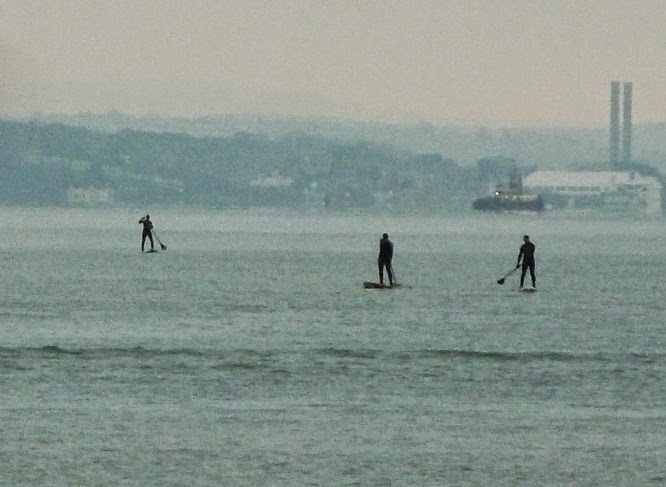 The chilly but settled weather had brought out these paddle boarders taking their's SUP (stand up paddle board) out into Southampton water, which for a change was remarkably free of motor boat wash, then again it was early in the morning. 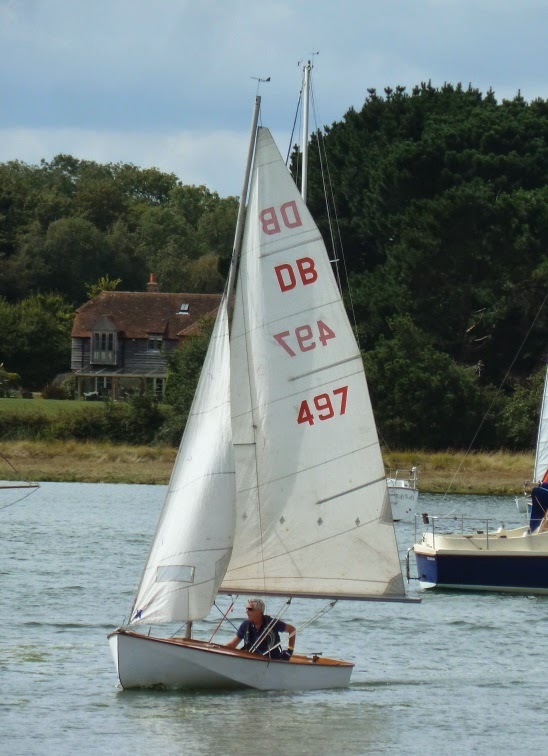 An early HW had brought out quite a fleet of dinghies from Hill Head Sailing Club, these look to be the Toppers, there were also Mirror's wayfarers and even a couple of Jacqueline class boats. In the foreground some early morning swimmers, given that the sea temperature was around 9 degrees and the air was 3 degrees maybe they were having the best of it, maybe! 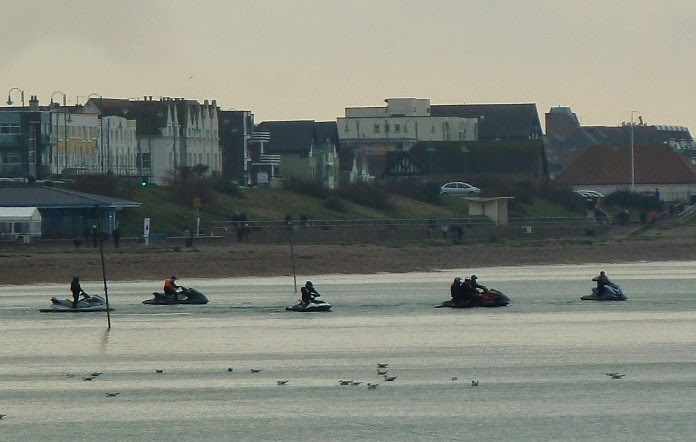 On the old hovercraft slipway at Daedalus a group of jet skis had gathered, any ideas what the collective noun might be? They all raced off in convoy, making surprisingly little noise and wash heading off towards the Bramble Bank presumably for a better look at the stranded ship. 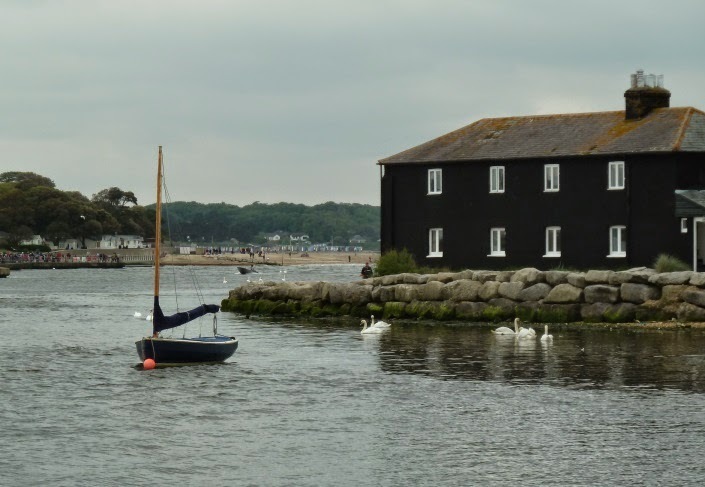 Back at the start of summer last year we took the short ferry ride from Mudford over to Hengisbury Head, the tide rushes in and out out of the narrow entrance to Christchurch harbour. 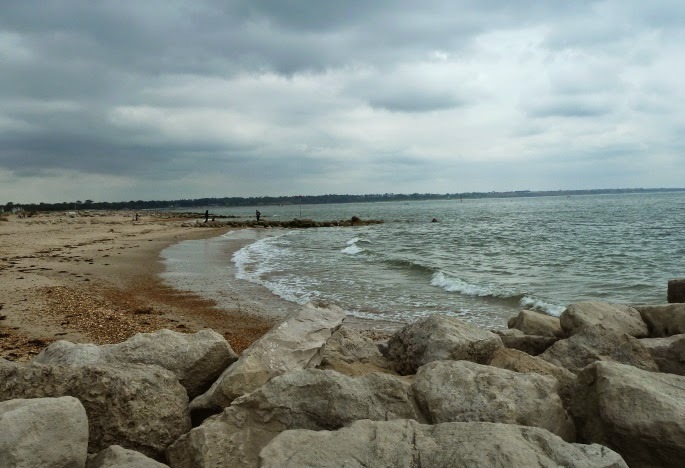 It's a short ferry ride across to Hengisbury Head, the spit which forms the seaward barrier of the natural harbour. 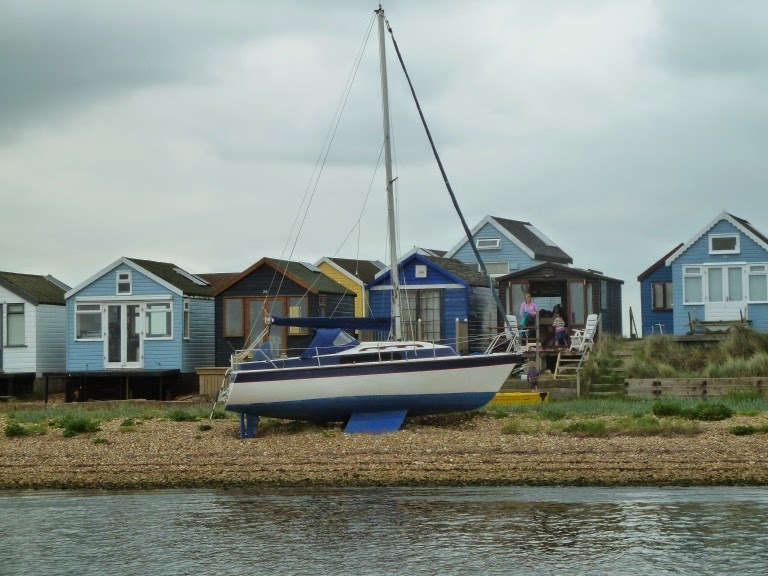 Once across things are very different, development has been heavily restricted and is confined to beach huts which must be a great place to spend a summer weekend. 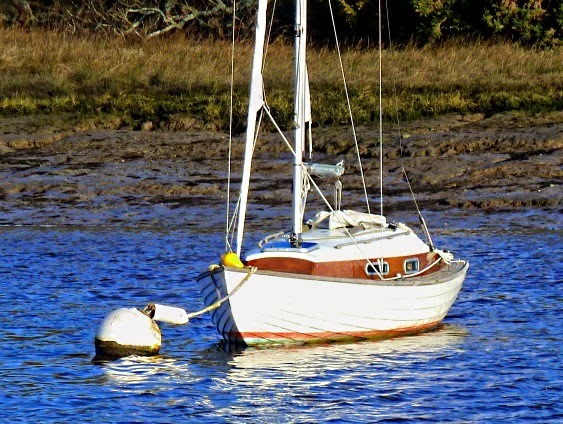 This bilge keeler is ideal for the area with the ability to take the ground since the harbour dries. Not quite sure this is quite the right spot, if she got up there on the big February tides then she could be there for some time. A few short yards across the spit to the beach and open water of Christchurch bay. 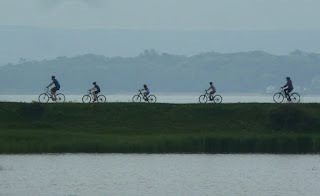 There's a good cycle route right around the harbour and back into the center of town. By the Christchurch Sailing Club there's a waterside park with a few cafe's and restaurants, which makes a nice lunchtime stop. It was a cold and windy start to the new year. 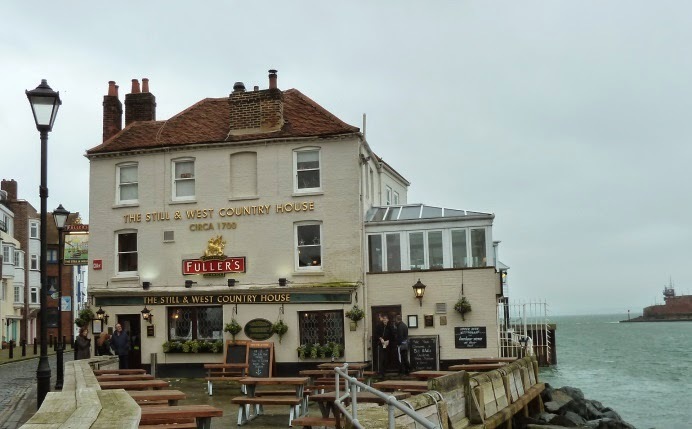 We decided have a walk around Old Portsmouth where the view across the Solent was pretty unappealing, low visibility and the strong south westerly wind making it decidedly chilly. 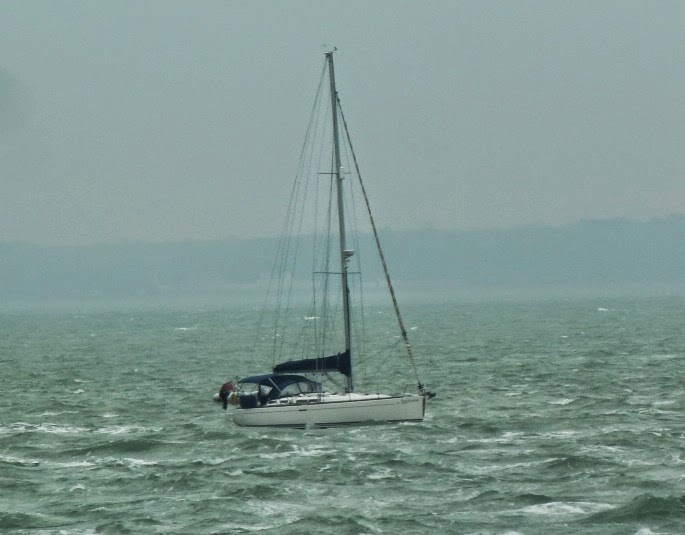 This lone yacht was entering Portsmouth against the strong ebb kicked up by the wind over tide. You can imagine the recent conversation "lets go away on the boat for new year, it'll be great fun, heater on, warm and cosy..."
Further along the Camber the serious drinkers were queuing outside, waiting for the Still and West to open. 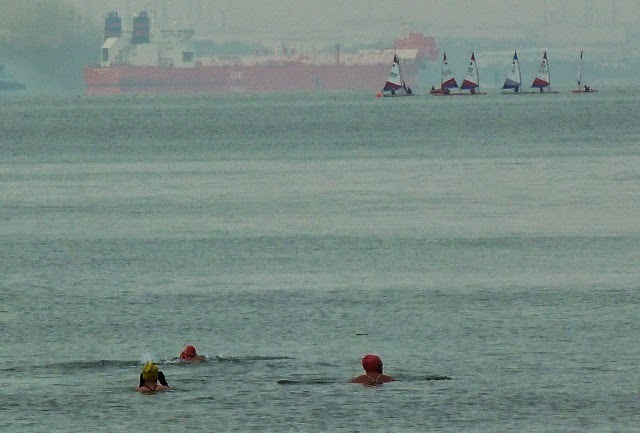 The air temperature was about 9 degrees C which is about the same as the sea temperature at this time of year which didn't seem to be a problem for this lone swimmer who apparently swims every day.